The Vedas are the recordings of sages to whom the mantras were revealed. They proclaim the transcendental Truth, which is not changed by time or place. They indicate the means to prosperity and security for the denizens of the three worlds. Veda is derived from the root "Vid", which means, "to know". The Veda teaches how to achieve purity of heart, getting rid of impurities. The Vedas have been declared to be infinite and hence beyond the comprehension of common people. In the beginning there was only one Veda. To study it considerable time and effort were needed. Vyasa divided it into different parts to enable people to study as well as practice the teachings of the Veda. Out of the countless number of hymns, Vyasa gathered some Rks and compiled them in the Rg Veda, collected some yajus to form the Yajur Veda and some Samans to make up the Sama Veda. 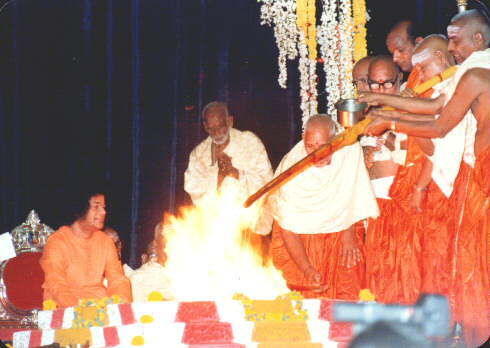 The Rg Veda is mainly devoted to hymns in praise of various deities. The Yajur Veda consists of mantras for worshipping the deities. The mantras of the Yajur Veda are used in the performance of yagas and yajnas and in doing acts of charity. Each Veda has three sections: Brahmanas, Aranyakas and Upanishads. The Vedic mantras were utilized in yagas and yajnas (ritual sacrifices) for promoting the well being of society and the world. They were intended to secure timely rains so that the crops may be good and there may be prosperity all round. The mantras, which form part of the Karma Kanda (the path of rituals), were regarded as conducive to the promotion of general well being and happiness. The great sages who listened to these mantras as revelations from the Divine found the key to them in eight basic letters. All the Vedic mantras with their musical rendering were remembered by reflecting on the eight letters: "A, Ka, Cha, Ta, Tha, Pa, Ya, Sa." The great seers fostered the Vedas by the use of these letters. Each of the Vedas had several saakhas (branches) and upasaakhas (sub-branches). Out of the 20 branches and 21 sub-branches of the Rg Veda, only three have survived today. Likewise out of 96 branches of Yajur Veda only two have survived the ravages of time. Sama Veda, which had 1000 branches, retains today only three branches. What is meant by Veda? One meaning is eruka (awareness). Another is thelivi (intelligence). A third meaning is viveka (discrimination). All those who wish to develop discrimination should be deeply interested in the Vedas. The Vedas have emphasized that man will be truly human only when he lives up to human values and practices the good life. The Vedas have a universal outlook, embracing all that is noble and sacred. They have taught the principle of samatwa (equality) in respect of everything. They have proclaimed the concept of oneness. They taught men to face joy and sorrow with equal serenity. The Vedas have been mainly concerned with the Pravritti Marga (the Path of Action). All the different branches of knowledge--physics, chemistry, botany, economics, music, etc.--are covered by the Vedas. These are concerned with the external world. Hence the Vedas have been considered dualistic. Only the Upanishads have taught the Nirvritti Marga (the Path of Knowledge) by going within oneself. This means that, of the four Purusharthas, the four main goals of man- Dharma, Artha, Kama and Moksha--the Vedas have been concerned with only the first three. The Upanishads declared that the nature of the Supreme can be grasped only by the Path of Knowledge. That knowledge is found in Vedanta. The Upanishads come at the end of the Vedas. The essence of all the Vedas is to be found in them. While Veda is dualistic, Vedanta is Advaita (nondualistic). It is only when you understand the essence of the Vedas as expounded in the Upanishads and put into practice the message of the Vedanta, you will realize the true meaning of Advaita (Non-dualism).